Tataki di tonno pinna gialla o Tataki di filetto di Chianina su crema di peperoni rossi, uovo marinat, cipolle rosse di Certaldo croccante e salsa di soia. I suggest you to take meats, they're qualities are quite high. You can choose between Tuscan meat and organic Florenz meat. I ate the grilled beef fillet in medium, it tasted very good. The T-Bone steak was also good but it could have been better if it was rare (because it was too dry by medium). I also ate a tomatoe spaghetti, I won't really recommend it. All in all, it's a good restaurant if you want to eat some good meats. With 50% discount the price is quite low and the CARBONARA is on average level. Good value for the price. It's the third restaurant that I have come across who offers "half-portions" in Florence, which provides curious eaters like me a great range of opportunities. 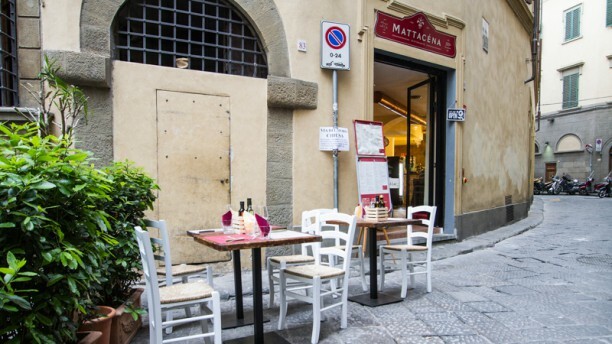 The menu stays traditionally florentIne but doesn't lack the touch of renovation, and the cute side is that, it also gives diners the liberty to combine whichever finger food/street food/tapas they want. nice ambient, young and energetic, suitable for a casual-smart business dinner as well as a friend-gathering or an easy date-dinner. Loved it and way to go! The menu is interesting, but service is off handed. It's not about being good or inconsistent but it lacks attentiveness. The food and drinks quality is undeniably good. good value for food. Owner is very nice. restaurant is very pleasant. The waitress who served us was warm and friendly, easily making our dining experience one of the most pleasant we've had in Italy's restaurants. The restaurant itself is lovely and authentic, with a menu with large variety and allowing guests flexibility in their choices (i.e. Half serving portions for some dishes). Lastly, the food was tasty and did not disappoint! Excellent food. Fiorentina steak, chianti - superbe! E' sempre un piacere pranzare da Mattacéna!! La ribollita è magnifica!! My daughter liked her pasta dish with truffles. I was less fond of the steak. I don’t think it was grilled over wood, so the flavor was off from my perspective. It was ok, but not a dish I would choose again at this restaurant.